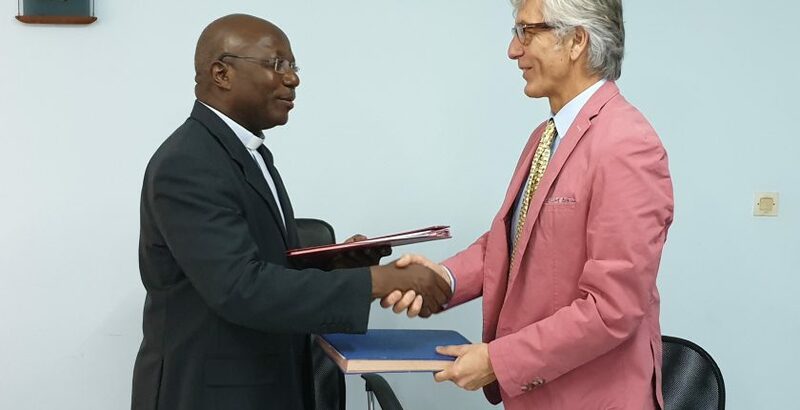 A three-year framework agreement was signed this Friday, March 15, 2019 in Abidjan between the Catholic University of West Africa / University Unit in Abidjan – Ivory Coast (UCAO / UUA) and the Center for Research and Education in Communication (CREC INTERNATIONAL) of Lyon (France). Appointed by the legal representatives of the two institutions, Father Bernard KABORE, for UCAO / UUA, and Mr. Yvan PARADISI, for CREC International, the partnership aims to strengthen collaboration between the two institutions in terms of training and research in communication. It formalizes the actions carried out for three years, by the international trainers of CREC INTERNATIONAL in the form of practical training sessions in communication, on the initiative of Father Dominique YANOGO, Director of the Higher Institute of Communication (ISCOM) within of the UCAO / UUA, to the profits of the students. In the coming three years the two partners plan to achieve different concrete results. Two major initiatives are planned: the launch of a multimedia production centre (web radio, video and audio production, digital distribution, etc.) within the premises of the UCAO / UUA, and the organization, of a summer school for media professionals, pastoral agents and Catholic media leaders of West Africa every 2 years at UCAO/UUA. The first edition of the CREC-UCAO Summer School will be organized between the end of July and mid-August 2020; It will be a hands-on training aimed at enabling participants to better understand the technological changes in the field of communication and to promote exchanges between media professionals. The establishment of the Summer School and the Multimedia Center will be co-directed by Father Fabrizio COLOMBO, a Comboni Missionary and the Project Manager of CREC, and a selected member of the High Institute of Communication (ISCOM) by UCAO / UUA. To guarantee the efficiency of its operability, the agreement provides for a mechanism of complementarity between the two initiatives: the multimedia center, which will be monitored by the ISCOM director, Fr Dominique YANOGO, with the participation of the students of the ‘ISCOM, will also serve as a platform for the realization of SUMMER SCHOOL. Since the framework agreement has a renewable duration of three years, it can be evaluated and enriched regularly.